This is a Victorian operating theatre, where proceedings were watched by an audience of gawping students and operations were conducted without anaesthetic or antiseptic. I mean, you really can’t begin to imagine what it must have been like, can you? The Old Operating Theatre is reputedly Britain’s – some say Europe’s – oldest operating theatre. 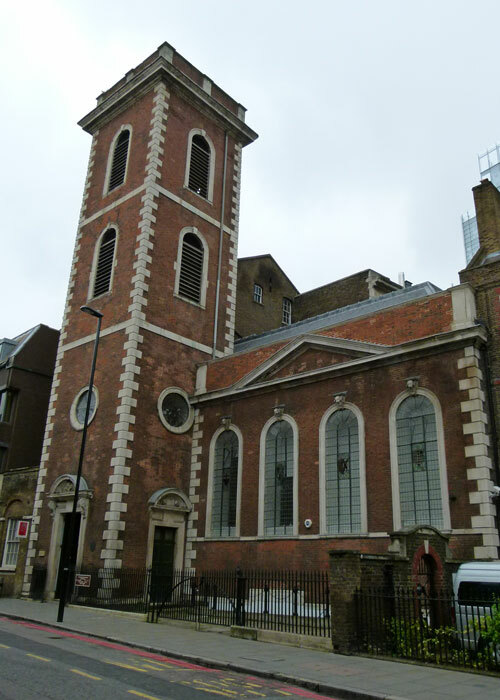 It was constructed in 1822, in the garret of St Thomas’ church in London’s Southwark – where there had been a hospital since medieval times, when it was part of the monastery of St Mary Overie. St Thomas’ Hospital, as it was known, was redeveloped in the 18th century and the church dates from this time. The garret was thought to be used by the hospital’s apothecary for storing herbs; apparently, poppy heads have been discovered in the rafters – but that could mean anything, couldn’t it? Next door was the women’s surgical ward, Dorcas Ward, where operations had traditionally been performed. Converting part of the garret to an operating theatre meant that the audience of students could be kept out of the way and it also made things a little quieter for the poor souls on the ward. Screaming can be so bad for morale. Anaesthetics did exist, but doctors had no way of controlling their effects (eg potential death) so it was felt best not to use them. The range of operations undertaken was fairly limited, though still seem fairly gruesome in the circumstances – for example, amputations, removal of skin growths, cataracts – particularly when you see some of the surgical instruments used. Surgeons had to operate quickly to minimise patient trauma, but the main lethal risk was infection – from the operating table, instruments and even the surgeon’s clothes. Infection was just not understood until Lister introduced the use of antiseptics in 1867. In 1862, the hospital moved to make way for railway development and the entrance to the garret was blocked up. It was rediscovered in 1956 and opened as a museum in 1962. 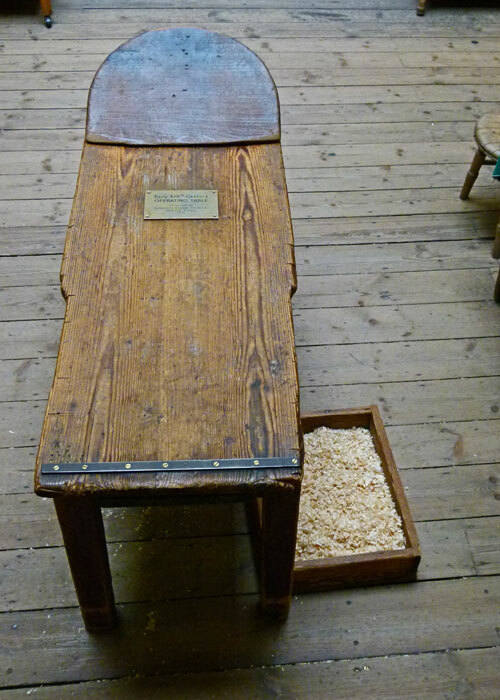 During the course of restoration, it was found that the floorboards beneath the operating theatre were packed with sawdust – presumably to absorb liquid of one sort or another. Whilst the building shell is original, the fittings are reproductions. The furniture is contemporary with the originals, but sourced from other places. Entrance is via a spiral staircase from St Thomas’ Street, through a small shop (which has much more interesting stock than the average naff museum emporium), up a further flight of wooden stairs and into the ‘Herb Garret’. The Operating Theatre is beyond that. And it’s a fascinating place to add to your list of ‘must visit when next in London’. One impression it left with me is the total lack of dignity these unfortunate women (or maybe fortunate, because at least someone was trying to help them) must have had. They were all poor women – the better off were treated at home and, if necessary, operated on there as well – sometimes on the kitchen table (seriously). Today, in the UK we have the National Health Service. (You may wish to interject a heartfelt “Hurrah!” at this point). Feeling slightly under the weather? Polite, friendly and efficient administrative staff will immediately, efficiently and unquestioningly ease your path in the direction of knowledgeable, experienced, medical professionals. These, in addition to being highly skilled in diagnosis and practice, are consummate communicators. Should your ailment necessitate a stay in hospital, you can not only be confident that it will be at least as good as lodging in a 5-star hotel but, also, that you won’t get any worse while you’re there; in fact, you have a better than even chance of survival. Finally, we can all rejoice in the knowledge that each one of us has been paying for all of this since 1948, so we own it. Not only does everyone in the NHS work for us, treatment is also free at the point of delivery. If you do not recognise your own ‘patient journey’ from the above, here is a link to the UK’s Department of Health’s website. 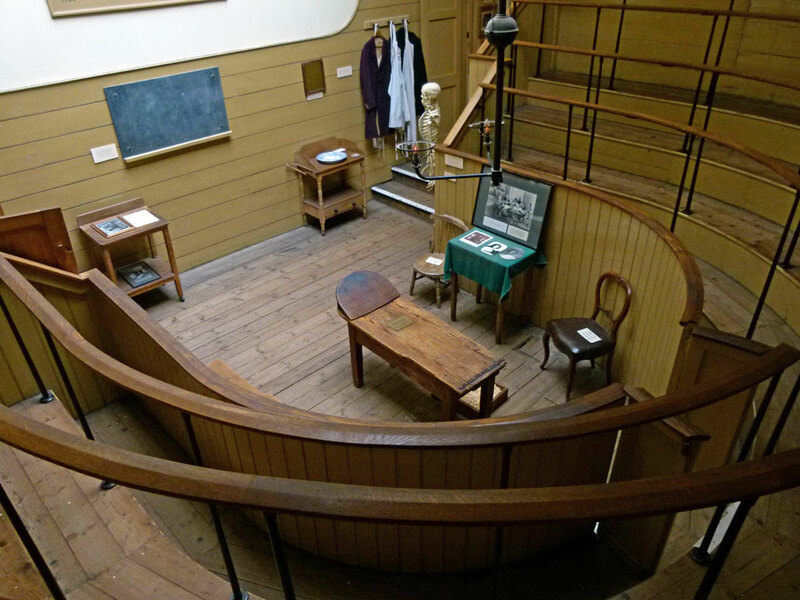 Go to A Bit About Britain’s listing for the Old Operating Theatre in the attraction directory, and explore to find more places to visit. I love horses and have always thought I was born in the wrong era, that I would rather live in the horse and buggy days. However, when I think of medical care back then…no, I don’t think so! My grandfather, Carl William Raetzsch was a medical doctor educated at Old Red, the Ashbel Smith Building, the oldest medical school building west of the Mississippi River, in Galveston Texas USA in the early 1900’s. I am thankful the building is still there. Thanks for dropping in, Betty. No – absolutely not! Frankly, it’s touch and go with the local GP these days, let alone in times past! 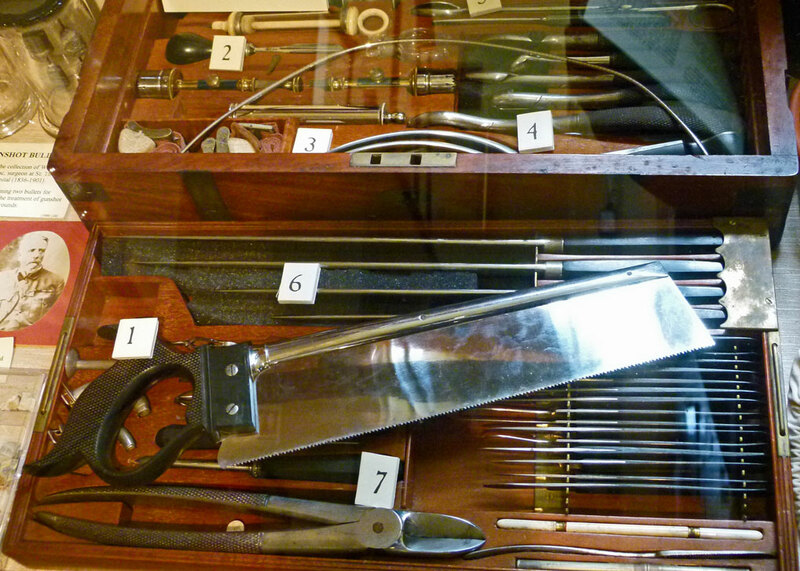 Looking at those old medical instruments just gives me the shudders! Now listen here… I go away for three days and come back to find you’ve been all over the country! (Or at least written about it.) I can’t handle all this excitement. :) Bear with me while I catch up with the commenting. Hurrah for the NHS – and heartfelt thanks to all the scientists, researchers, doctors, surgeons and nurses over the years who have continued to improve and perfect the treatment of us ordinary folk when we are ill.
I’ll drink to that; the clinical staff are usually amazing. Just wish they could do something about the patently inefficient administrators. Yes that would be something! My Dad his tonsils removed without anesthetic at the age of 28 while sitting upright on a wooden chair in front of a group of students – barbaric! I don’t know much about your NHS but I do know that I am glad that Canada has universal health care coverage. Friends and family in the USA have been made bankrupt by catastrophic illnesses that are treated here as a matter of course. Aargh – why would your dad do that? Horrendous! I wonder how many students passed out in those seats, listening to and watching the agony of the patients operated on. Yikes. It’s like something out of the Inquisition! Informative as ever. Thank goodness for our wonderful NHS and all who work for it. Long may it continue. Hi Mike – I must visit this at some stage … and I note your ‘Attraction Tab’ .. I’m sure it’ll be well used – as you do give us a great discourse on the various subjects. Love the idea of the Herb Garret … and finding poppy seeds – bet they’d still be ‘live’ and would flower … I wonder if they tried. Truly, one can’t begin to imagine what it must have been like in those days. Nice history lessons. Greetings!